Going into recruitment, you might have some questions for us! Here are the most common questions we have received and their answers. We are a student-run advertising agency, working with real clients and gaining real-world experience. We are the next generation of analysts, creatives, strategists, and marketing mavens. Check out our reel for a closer look at what we do. Real-world experience, a family of peers and an amazing mentor, hundreds of alumni connections, networking trips, and more are just a few of the reasons to apply. Need more convincing? Watch why some of our members chose to join PRISM here. 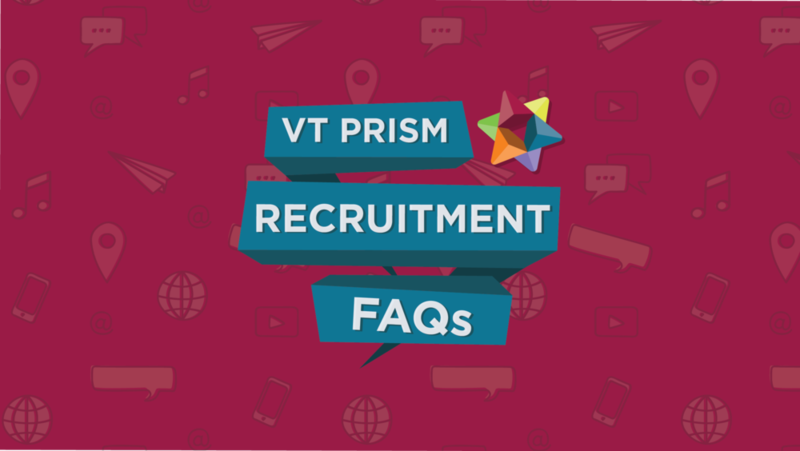 Go to vtprism.com/recruitment and fill out the application linked on the page by the deadline, October 20. What positions can I apply for? What do each of them they do in PRISM? Accounts: Assist account manager with various tasks concerning the client. Graphics: Create graphics for various client accounts and work closely with Account Managers and clients. Analytics: Help to create analysis and insights to clients. Copywriting: Write blogs, articles, and content for programs and flyers. Multimedia: Video and photo content creation for clients including highlight reels, commercials, and stock photos. Social media: Create brand awareness for clients with various social media platforms; works closely with Analytics. The time commitment varies based on your role and the account you are on. Typically, the time commitment is manageable--PRISM just has to be a priority right below your school work, of course! PRISMites are required to attend weekly meeting on Tuesdays at 7 pm. These meetings last about an hour and are valuable to stay in the loop on all things PRISM! Is there a GPA cutoff? Yes, there is! We look for PRISMites with GPAs over a 3.2. If you are a freshman, we look at your high school GPA. So you got an interview--what should you wear? Business casual is appropriate for an interview. For girls, a dress with a sweater or blazer, dress pants and a blouse, and closed toe flats or heels work best. For guys, this means a button down shirt with nice khakis or dress pants with dress shoes. No jacket or tie is necessary. We hope this post answered a number of your questions! Applications are open from October 9 to October 20.